There are a number of travel companies in Kota Kinabalu (KK) that can arrange tours. Most of the major hotels have travel desks and there are various offices around the city. 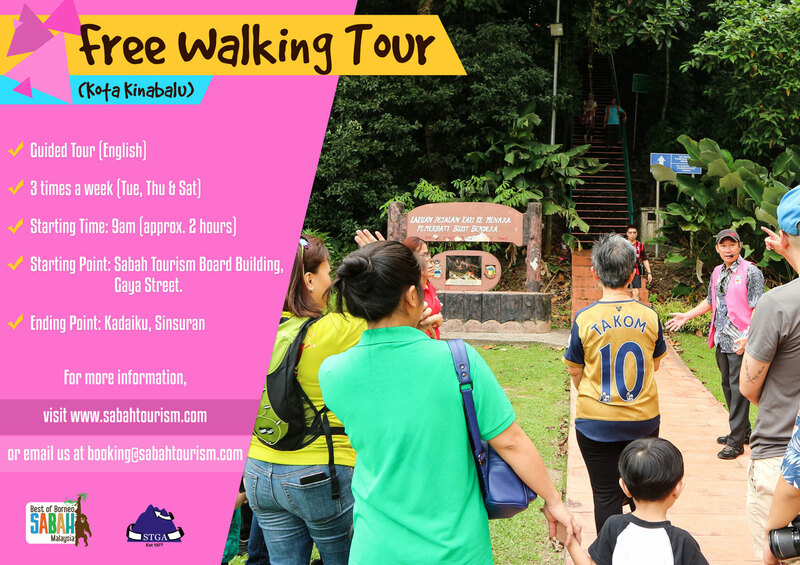 But, have you heard about Free Walking Tour in KK ? Yes, you are right ! The tour is completely non-commercial and sponsored by Sabah Tourism Board. Hmm you pay afterwards whatever you think is worth as a tips to the guide (it's up to you). There are no meals included, no shopping involved nor any food stops or toilet breaks. What ? well, the tour would run approximately about 2 hours only. In case of bad weather, construction, parade or similar occasions the tour is adjusted accordingly. Meeting point is at Sabah Tourism Board building in Gaya Street and ending will be at Kadaiku, Sinsuran. During this tour, you will have the opportunity to see what is considered to be the best of Kota Kinabalu. Free tours start every Tuesday, Thursday, and Saturday. Tour guides are local and they are happy to share a genuine experience of the city with you. Because who could introduce you the city better than the people living in it, and knowing the local culture from the inside ? And such we are able to give all the tips about what to do and where to go. We are ambassadors of our region and I, as a Sabahan is more than happy to welcome you to visit my homeland, Kota Kinabalu Sabah. Because we love our city and we love sharing it. We are eager to talk about everything and would hate to be boring, even for a minute. For more info regarding this program, please do contact Sabah Tourism. have not been to Sabah for quite some times... gonna plan it a day and join the local programmes there.. must be fun! Hello dr-Life, yeah you will be enjoy and having a lot of fun in KK ! teringin nak ke Sabah..Nak share dengan kawan lah, boleh jimat perbelanjaan ni. Teringin nak ke Sabah. Kalau ada peluang ke sana boleh la cuba walking tour ni. Msti dpt byk info dr tour guide kan.
Tak pernah lagi menjejakkan kaki ke sabah. Planning tu ada tapi kekangan masa blom sempat lagi. Do we have to register anywhere or just be at the meeting point before they start? I suka nak explore Sabah..kalau boleh nak explore semua tempat..tapi tahun ni tangguh dulu and yes maybe tahun depan..
haven't been to sabah yet.. great to hv such a nice vacation like this.. envy envy! I understand there is max participants of 15 person. Is there any min participant? Let say if there is only 2 person wanted to join, will it proceed? Missing Sabah! The last I went was like many years back. I would love to re-visit this place soon. Good that they have free walking tour program here. Save cost for budget tourist. So far lah to join the free walking tour hehehe it's best to be able to go for health. Long time not going to Sabah hehehe..
Tak pernah ke Sabah, hanya plan saja. Tapi banyak tempat yang best boleh lawati kan? Tak pernah sampai ke sabah lagi. Boleh risik-risik nanti ni. Kena daftar dulu ke macam mana? inisiatif yang bagus la kan ni..dah la free, satu aktiviti yang sihat pulah. Good job Sabah! Last time i pergj sabah was on August this year. Tak tahu pun ada program macam ni kat sabah. sangat jimat tu. Never have i been in Sabah yet. But activity that involved nature like the Free Walking attract me lot. Would love to explore the place if i’m there. thanks for sharing. really helpful for me to planning on vacation to KK with family. Thanks for the information, I wish to go back to Sabah again soon.